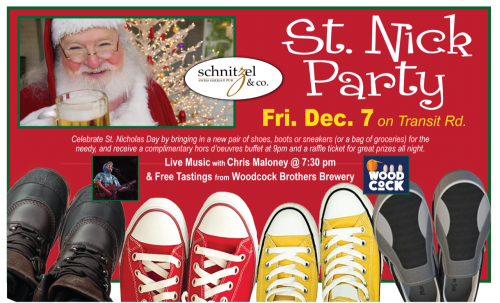 St. Nick Party Featuring Live Music from Chris Maloney!Schnitzel & Co.
St. Nick Party Featuring Live Music from Chris Maloney! Join us Friday, December 7 at 7:30 for our annual St. Nick Party. Bring a pair of boots, shoes or sneakers (or bag of groceries) for the needy, and receive complimentary hor d’oeuvres buffet at 9pm and a raffle ticket with great prizes all night. Live music with Chris Maloney starts at 730 with free tastings from Woodcock Brothers Brewery.